This week has included N’s birthday, all of us getting hair cuts (separately), lunch with a friend, and a bit of snow. Week 4 started with Sunday and the first mini red tennis match of the season. It was an unknown team as they weren’t in our round robin group last season. It turned out fairly evenly matched. All of the kids won a singles and lost one, but ours managed to win both their doubles matches so we ended up winning. Their first team win and it was great to see their team spirit and enjoyment. This could be a good season for them if they play as well as they did in their other 2 matches. Monday was birthday time. N is now 8. He was full of cold which wasn’t great, but soldiered on at school, even managing to do multisports afterwards. He had tea at the farm as usual but had his cousin there, and a cake with candles. Because he had a cold, he had to waft the candles out instead of blowing them out. I took a bit of time off as flexi so I could be there earlier for him – noone had actually told me they were doing birthday tea at the farm, so I was pleased I’d been there. But not pleased at not being told – I’d bought a little cake and candle for him to do at home so that went to waste. Although N didn’t even want to eat cake as he wasn’t feeling great with his cold. Tuesday it snowed. Well, all of about a centimetre. That’s enough for me, and thankfully most was gone on the journey to work. My commute is only 7 miles but there was nothing in town at all. I had to stop off on my way to work to capture the sunrise and sheep in this field. It’s perfect light falling in just the right place for standing by the gate. The sheep thought I was going to feed them so all trotted over, but were disappointed. Wednesday was another school and work day. Not a lot else happened. Thursday was more of the same. The OH had his postponed hair appointment (with his ridiculous trip 45 minutes away for it!). I refused to let N go because it would have meant him leaving school 15 minutes early. I think I’ll now just take him into town as and when he needs a cut instead of waiting for the random appointments the OH books. It means I won’t have the phone call in the morning to after school club to say he won’t be in that day, asnd won’t cost me the £14+ I’ve already paid. Friday was a busy one. I had a flexi afternoon off, so had lunch with a friend. It was lovely to catch up (I always feel like I talk too much though), but the food was disappointing. We both ordered halloumi burritos, but mine had to go back because the halloumi was missing. Then neither had the claimed sour cream and guacamole in so were a bit dry (and a bit too spicy for me without them). After picking N up from school I had to rush him into town to have a hair cut, then off to tennis. Tennis was better than last week numbers wise, but our group didn’t have any proper coaching time as they were just doing a lot of rallies. I really hope he moves up at Easter so he’ll get some more coaching time in a smaller group. I think there’s a few parents are frustrated because of the lack of proper coaching. Yes it’s only a group session, but there’s less now there’s the same number of coach and assistants (one of whom leaves early) to a much larger group. Saturday was N’s swimming lesson. It’s going really well and there only seems to be 5 in the class which means lots of attention. It’s like tennis and swimming has switched round with the issues this term. I also get to chat to someone’s mum who’s eldest used to be in N’s class since Water Babies, and youngest swims at the same time as N. She’s having the same issues we were having in stage 4 too (but different teacher). Her eldest isn’t progressing as she should, the class is too busy, and they’ve moved up way too many people who’re a long way behind the best 2. Hopefully she’ll be able to get her moved into the more advanced level 4 class we’ve just left, and then get her moved quickly up into N’s group again. I had to get N rushed off to join the shoot on the farm – we just arrived in time for hotdogs and drinks. Then I had to get into town for my hair appointment, being late thanks to terrible traffic at roadworks and a car park machine that wouldn’t put card payments through so I had to ring up to pay. Next week is going to be my manic work week – I’m just praying that the sore throat N has passed onto me doesn’t come out properly before my big work meeting and event. And that the snow that’s threatening, similarly doesn’t turn up to ruin the event. What do you do if snow stops half of your speakers turning up?! A big Happy Birthday to N. I cannot believe they are now 8…that feels like it’s just completely flown by. I hope the sore throat eases, I found manuka honey was a massive help for me a couple of weeks ago. The sheep shot is just stunning! Happy birthday and oh no to the cold!! We are lucky as managed to escape all snow so far! Loving the photo though! Happy Birthday N. Glad the tennis went well. Hope the snow holds off so your speakers can get to the event. Love the picture of the sheep in the snow. Happy belated birthday to N, shame he is feeling rotten with a cold, and I hope yours does not come to anything. The farm will be a busy place at this time of year. Love the sky looks great with the sheep and snow. Aww Happy Birthday to N hope he had a great day. Sorry to hear he’s not been feeling great, there’s so much going round this time of year. Good luck with your event and meeting next week I’ll keep my fingers crossed that snow doesn’t make an appearance for you. Happy birthday to N! Well done to him and the team on their tennis win. I hope the coaching improves for him soon. 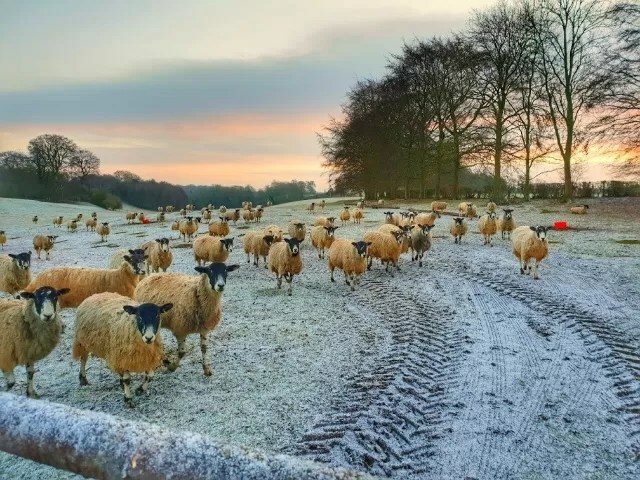 The sheep photo is fantastic, you’ve captured them perfectly. Happy birthday to N! Such a shame that he was poorly. I hope he’s feeling better now. I hope all goes well at work next week. Good luck. What a spectacular shot! Love it! It reminds me of the 19th century paintings of the countryside. Happy belated birthday to N! Sorry to hear he had a cold on his birthday, hope he is better now. The missing halloumi sounds annoying. How could they miss the main ingredient? !